The strange heroism of Chuck Grassley. As the Senate took aim this summer at private equity firms, dragging hedge fund managers and other Masters of the Universe to the Hill to explain why, exactly, they needed tax breaks, one senator stood out for his degree of outrage. Having co-sponsored a bill to force the Wall Street wizards to pay their fair share of corporate taxes, Senator Chuck Grassley threatened to go to the mat to pass it, declaring: "I'm going to do it regardless of how unpopular it makes me." From his brash rhetoric, you'd be forgiven for assuming Grassley was some kind of share-the-wealth liberal, somebody like, say, Charlie Rangel-- who, in fact, is taking on private equity in the House. But Grassley is a conservative Republican--and ranking member on the Senate Finance Committee, a territory where the steady flow of Wall Street donations tends to inhibit this kind of economic-justice crusading. Look through his record, though, and Grassley's heresy on private equity isn't a surprise. Over the past six years, Grassley has been behind many of the exposes that have undermined GOP sacred cows--a role that sets him at odds with the relentlessly on-message Bush-era Republicans. He requested the inspector general's juicy investigation into the expenses of Smithsonian head Lawrence Small last February (see "Smallville," February 28). (When the report didn't dig deep enough for Grassley's taste, one of his aides was deployed to help a Washington Post photographer sneak inside Small's office and snap humiliating pictures of his $2,043 armchairs.) He took the FDA to task for getting too cozy with Big Pharma, teamed up with Senator Patrick Leahy to champion FBI whistle-blower Coleen Rowley, and reduced Bush's wished-for tax cut by half. He's also beaten up administration hacks, including--with a notable lack of party loyalty-- Health and Human Services Inspector General Janet Rehnquist, the late jurist's daughter. "[Rehnquist] was ousted because of [Grassley's] investigations," says Danielle Brian, executive director of the Project on Government Oversight. In some sense, Grassley embodies the most ancient of conservative principles, a suspicion of institutional power. But it's incredible that Grassley has retained this disposition during the Bush years, when amassing institutional power became conservatives' reigning m.o. "A large majority of people are annoyed by [my oversight], including my colleagues," he told me--but, even so, he resisted the pressure to conform during a time when dissidents disappeared. What does Grassley have that his fellow Republican colleagues don't? Two weeks ago, I traveled out to Iowa to meet this Republican hero, arranging to join him on the last leg of a Des Moines-bound bus tour he was leading for foreign ambassadors and diplomats to boost the state's visibility in trade. Re-reading his resume (and his pugnacious one-liners) on the plane to Cedar Rapids, I conjured up a sort of heartland Gregory Peck, a politician who channeled the old-fashioned, self-assured brashness of the iconic American fighter for justice. When I finally connect with Grassley at his bus in a rural parking lot at seven in the morning, he isn't contemplating frauds and abuses to vanquish, though. Nor is he boning up on the businesses we'll see later; nor is he even ruminating for the ambassadors on the singular charms of the endless farmland around us. No, Grassley's chief topic of interest as we set off--and one that continues to come up hour after hour that day--is Dairy Queen. "Tell them to make mine big!" he instructs David Young, his chief of staff, grinning in anticipation of a scheduled Blizzard stop. There's a problem. The group is too big for everybody to choose their own flavor, so the staff has sensibly pre-ordered giant boxes of the Oreo Cookie variety. "What?" Grassley bleats. "I want Snickers!" My vision of Gregory Peck vanishes, replaced by Pee-wee Herman. For all Grassley's valiance on the Hill, in person, he is amazingly childlike. His pants hitch up into the back of his black sneakers. When he smiles, it's the huge, goofy grin of a boy posing for a school picture before he learns smiling is uncool. "What'd I do wrong?" he sometimes asks his staff, without provocation. As we were finishing up an interview on the bus, the senator pauses to ask his press secretary if it's all right if he doesn't visit the bathroom before eating lunch. "Right before leaving the last stop, I washed my hands," he says. "Is that okay?" But I suspect the answer doesn't matter much to Grassley. He doesn't care what the grownups think. As I travel with him on tour, I realize it's just this attitude from which his good works flow. Since his start in politics, Grassley has followed his own eccentric path. After college, he joined the Iowa state legislature, where the political upheavals of the 1960s largely passed him by as he dealt with such retro issues as temperance ("As a teetotaler, I was thinking people were drinking too much"). In 1974, he was elected to Congress, beating "a more competent person than I was," he recalls. By the time he got to the Senate in 1981, Washingtonian magazine promptly dubbed the hayseed freshman "Tweedle-Dumb," the second stupidest member of the body. But, in 1983, Grassley stumbled across something that tweaked his frugal Midwestern sensibilities: binge-spending at the Defense Department (he would go on to express particular horror at the $435 dropped for a claw hammer--since, as a salt-of-the-earth type who had actually made use of a hammer, he knew they definitely should not cost $435). Grassley contacted a Pentagon employee who wanted to blow the whistle on the cost overruns, but Defense Secretary Caspar Weinberger and a Reagan political appointee named David Chu barred the two from meeting, thinking that the bumpkin from Iowa was too stupid to get around their injunctions. Grassley jumped into his little orange Chevette and drove over to the Pentagon himself. "It was kind of a simplistic thing where he said, 'If you're not going to be in my office like you promised, then I'm going to come over there and find out why not,'" says a former Grassley staffer. Grassley confronted Chu, succeeded in mounting a massively publicized hearing for the whistle-blower, and, in the end, froze Reagan's defense budget. Chu--the arrogant, faceless bureaucratic fixer--came to represent, for Grassley, what he had been put on Earth to fight. "This ... Mister Chu ... is still active in the administration somewhere," Grassley tells me with distaste on the bus. He went on to co-sponsor the 1986 False Claims Act, a bill to protect contractors who reveal that their companies are defrauding the government, and pushed for tough oversight throughout the rest of the '80s and '90s. But Grassley has a child's love of moral consistency, and his commitment to oversight, good government, and fighting against wasteful spending began to give birth to a whole separate way of living in Wash-ington. At home in his Arlington town house, he keeps his air conditioning set to 80 degrees. Driving into the Senate garage, he turns off his car and coasts into his parking space to save gas. Although he attends his party's weekly luncheon, he does not eat because the meal costs $25. The culture of Grassley reached its apotheosis in the 2004 reelection campaign ad he aired in Iowa, where he posed atop an efficiency-maximizing Rube Goldberg-esque lawnmower he designed himself by welding two pull-mowers to the back of a seated one. More than seeing him as an example to follow, though, Grassley's colleagues came to find him mystifying. To them, his insistence on including the Democratic ranking member in his Senate Finance work on the principle of bipartisanship was abdicating hard-won power. "It was a constant, constant criticism," Grassley admits. The sense of alienation is mutual. When I ask if he ever feels socially awkward in Washington, he replies gaily, "No, because I don't socialize in Washington!" He adds, "I can tell you the last time I was in another senator's home: John Cornyn's, two years ago." His disregard for being popular among his Senate peers, his stubbornness, his moral absolutism--these qualities have inspired great battles against corruption, but they've also generated great bouts of obliviousness to the more nuanced operations of power. "There were trade-offs in working for him because he had integrity," explains the former staffer. During the 2003 negotiations over Bush's tax cut, for instance, Grassley made a promise to Senator George Voinovich that the cut would not be over $350 billion. Although both Bush and the House wanted a bigger cut, Grassley wouldn't consider going higher, triggering a bitter and public intraparty feud. "House Republicans were saying, 'This is ridiculous, this is ridiculous, we need some compromise,'" remembers a former House Republican aide who worked closely with Grassley to conference financial legislation. "Grassley just said, 'No, I don't care.'" Four years later, the aide is still angry about the episode. "I mean, really, what's the difference? Imagine going to the grocery and spending $100 in groceries, but not $100.55." I got a taste of Grassley's literalism the morning I left Iowa. The day before, on the way to Des Moines, Grassley had invited me and any interested diplomats to join him on his morning jog. He seemed particularly excited to run with others. I was excited, too. After everybody had gone to bed, I even took a hotel shuttle out to a 24-hour Wal-Mart to buy new sneakers. We were to meet the next morning in the hotel lobby at 5:15. At 5:16:30, my elevator deposited me downstairs: The senator was already gone. Losing his Senate Finance chairmanship in January, Grassley was himself to the end. When incoming Democratic chairman Max Baucus presented him with the parting gift of a wooden gavel, Grassley groused, "It probably cost more than it should, and more than I would have spent on somebody else." Luckily, his colleagues knew him well: Baucus assured him that the gavel was not a new purchase but Grassley's old one. "OK, so it's worn out," Grassley said. "Thank you very much." Grassley's behavior when he was in the majority means that, in the minority, he retains more power than Republicans who screwed their opposition counterparts. Baucus has scolded officials who appear inclined to pay less attention to the demoted Grassley, telling them, "If Chuck asks you something, it's like I asked you for it." Though Baucus is also worried about private equity, he's allowed Grassley to take as much--if not more--of the lead on the issue. 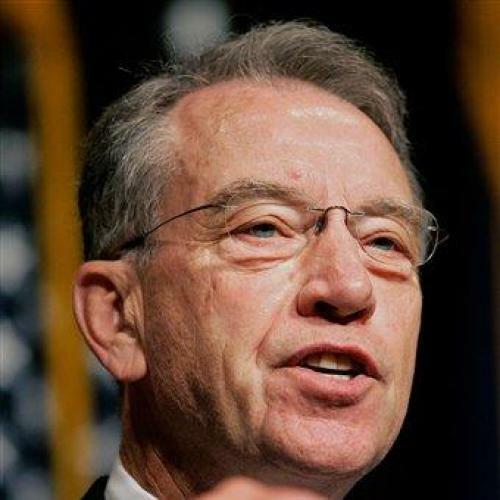 It's a battle in which Grassley's passion for fair government can shine. His continued prominence also feels just because, out of all the Senate Republicans, he probably deserves the least blame for their 2006 catastrophe. At the end of the bus ride to Des Moines, standing outside Dairy Queen--that special Snickers Blizzard did come through in the end--Grassley laments the Republicans' November loss. He's still stunned by what happened, and he even entertains the possibility that, via some convoluted mechanism, it might have been all his fault. Though he noticed his colleagues running wild, "I stood by the sidelines," he says. The hypothesis is unconvincing. It's hard to imagine other Republicans would have accepted behavioral advice from a guy like Grassley. But at least--unlike other Republicans--he's willing to say he's sorry.